"You can be as unyielding as the mighty Oak Tree against the raging winds and be torn up by your roots... or you can be as the Willow Tree and bend with the wind!" 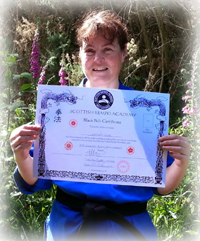 Yoshin Kempo (Japanese Kanji characters in the above image) is the Martial Art taught within the Scottish Kempo Academy and is recognised by the Government of Japan. Yoshin being the style and Kempo (Karate) the art, this is a Japanese term meaning Willow Heart Fist Law. The Yoshin Kempo Self-Defence system incorporates elements of JuJitsu and was created by our Founder: Kyoshi (Professor) Neil Hourston, who is a Master of both arts with lineage to ancient Kempo and JuJitsu Ryu (schools). Yoshin Kempo is a modern life-protection art based on proven battlefield skills used by the ancient warriors of Japan, the legendary Samurai. Yoshin Kempo is a non-competition Martial Art. Our extensive and practical syllabus includes: strikes, kicks, punches, throws, joint locks, bone breaking, chokes, strangles, nerve points, board breaking, bag and pad work. Certain techniques are adjusted for, or excluded from, children. 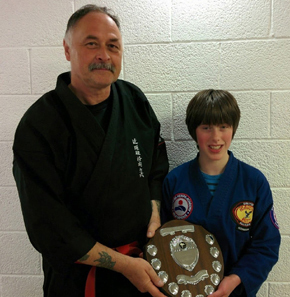 The syllabus prepares Kempoka (Kempo practitioners) for a no-nonsense approach to combat. High kicks are rarely employed as kicks are generally directed at mid-to-low-level target areas whilst multiple strikes and punches are mainly executed to upper body target areas. Practical throws are performed which are designed to inflict maximum damage to an opponent upon impact with the ground whilst ensuring that the defendant does not cause undue physical exertion to oneself. 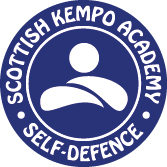 Kempo techniques are studied in a safe, structured and friendly environment with a matted area for throwing techniques. Tactical concepts which includes: manoeuvres, zones, distance, positioning, timing and awareness are essential facets of the art. 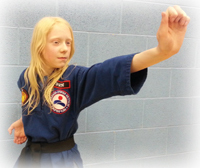 After learning the art's basic structure, Kempoka are encouraged to tailor techniques within the base system to suit their own requirements based on skill, height and weight, thus placing emphasis on an art which everyone, regardless of ability, can incorporate! Discipline is the foundation of the Martial Arts. 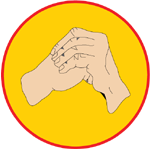 In our art, practitioners display respect towards each other via a bow which is made by placing the left hand palm down over the top of the right hand which is clenched into a fist shape and held at chest height. This salutation is called the 'Hokem' and means to 'cover or hide the fist' reminding practitioners to only use their combat skills in protection of life. It further signifies that one should maintain balance in their life. Akiyama Shirobi Yoshitoki was a Doctor from Nagasaki, Japan, who travelled to China to study Chinese medicine. During his stay he also studied some techniques from various Chinese Martial Arts. Upon his return to Japan he taught the techniques he learned in China but found it hard to keep students as the number and effectiveness of these techniques were limited. As a result, Akiyama retired to the temple of Temmangu at Tsukusai around the year 1723, there he felt he could further study these techniques in depth and attempt to expand on them. During his winter stay, he noticed the snow piling up on the branches of the trees outside the temple and noticed that whereas the snow piled heavily on the stiff branches of the mighty Oak tree, that it slipped harmlessly off the pliable branches of the Willow tree. Eventually the branches of the Oak tree began to break under the weight of the heavy snow but the Willow branches simply yielded and allowed the snow to fall off, thereby saving the tree. This brought a great enlightenment to Akiyama and he used the concept of flexibility to greatly increase the number and effectiveness of the techniques. He decided to name his Japanese system Yoshin-Ryu JuJitsu. Kosho-Ryu Kempo (Karate) was founded by a Buddhist monk named Daruma, who was the successor of the first Buddha: Gautama. In 530 A.D. Daruma introduced Ch'uan Fa to the Buddhist monks of the Shaolin temple in China so that they could protect both themselves and the temple from bandits. Travellers introduced Ch'uan Fa to Japan and the Samurai blended elements of the art into their JuJitsu systems. The Kosho-Ryu Kempo system was founded by a Buddhist monk named Eizon (Kosho) Bosatsu, who, in 1235 meditated under an old Pine tree in the grounds of the family temple in Japan and came to an understanding of natural law which gave him a perfect method of defence and escape. Kosho-Ryu Kempo was brought to the West from Japan by it's 21st Grand Master - James Mitose, who lived in Hawaii, USA. In Japanese, Ch'uan Fa is known as Kempo or Kenpo, there are differences of opinion on how the art should be spelt due to various interpretations of the oriental characters in Mandarin, Chinese and Japanese. However, there is consensus that the art is pronounced with an m. We simply spell the art as it's pronounced: Yoshin KeMpo.